I honestly cannot understand people who hate broccoli. Now hold on- give the poor vegetable a chance! Broccoli has been unfairly lumped with the most hated vegetables, amongst brussel sprouts, cauliflower and beetroot. All of these vegetables have redeemable qualities; except you beetroot, you’re absolutely hopeless. I find that the reason why people hate these vegetables is often not because of the way the vegetable tastes but the way that it is prepared. Broccoli is often steamed until it becomes a mushy lump of green slime. 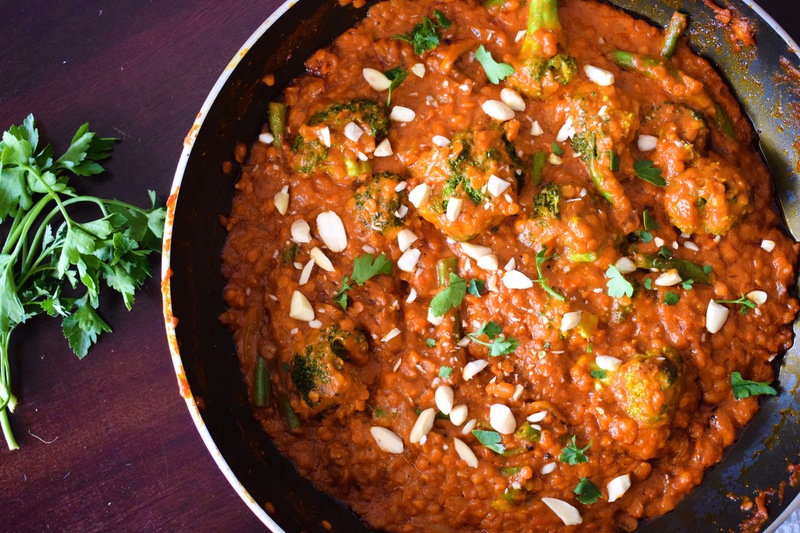 I’m here to show you that broccoli doesn’t need to be steamed into submission, it can be thrown into a curry just before serving, left to soften and absorb the flavours of the curry and come out tasting fantastico! Don’t believe me, just give this recipe a try. Heat some olive oil in a large non-stick saucepan. When the oil is hot, add the onions and the cinnamon stick. Fry the onions on high until starting to turn golden brown. Add the curry paste and tomato paste and stir to combine. Cook for 2 minutes or until the tomato paste is starting to caramelise; you’ll be able to tell by the browning of the tomato paste on the edges and the smell of the curry. Slowly pour in the coconut milk, stirring whilst you do so. Season with salt and pepper to taste. If the curry is too spicy then add more coconut milk. 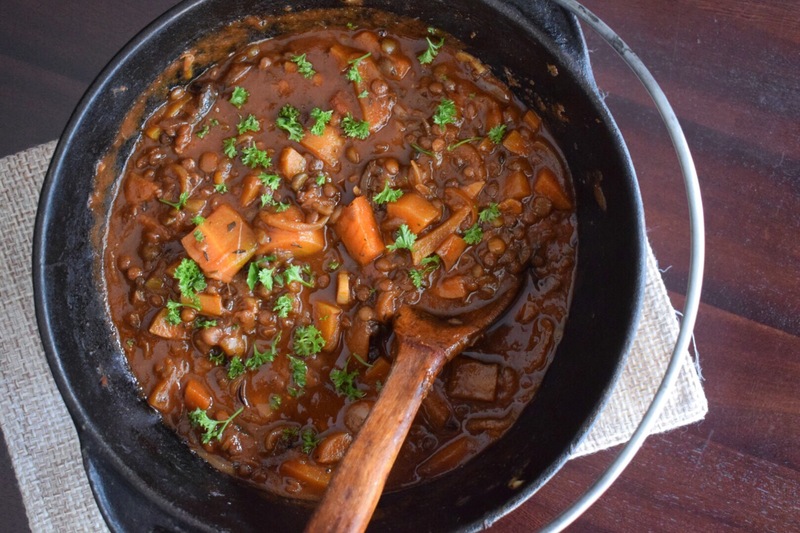 Bring the sauce to a boil before adding the lentils and reducing the heat to low. Simmer for 15 minutes or until the lentils are cooked- they should be soft but not firm to the bite. Throw in the broccoli and green beans and stir to coat in the sauce. Cook for another 5 minutes. 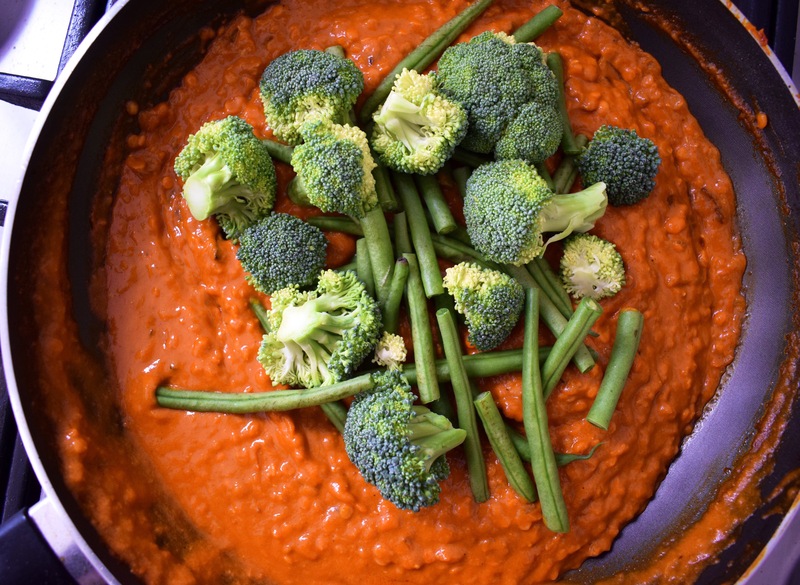 If you find that the curry is too thick for the broccoli then add ½ cup of water to loosen it up. Just before serving, stir the garam masala and lemon juice through the curry and season one last time with salt and pepper. 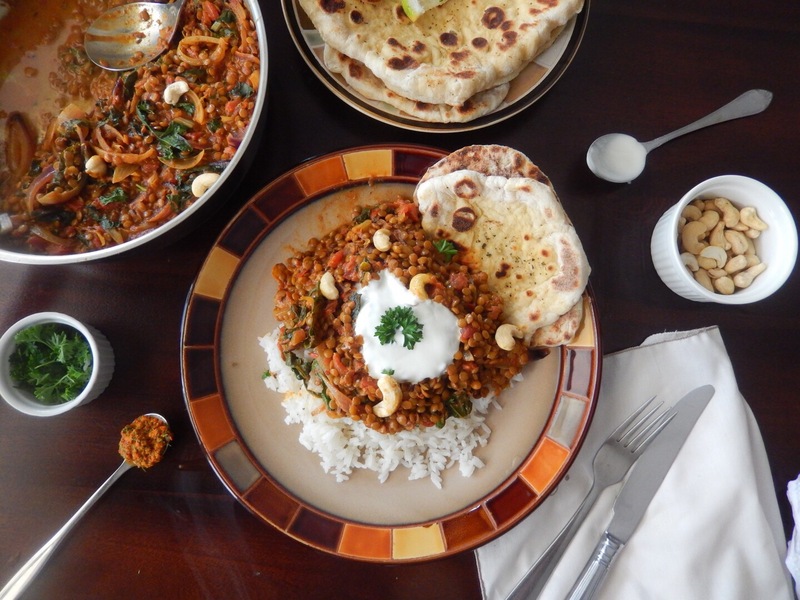 Serve hot with some warm naan and jasmine rice- enjoy! It’s been a while since I’ve made a comfy, stay-at-home-and-put-your-feet-up kind of stew. That’s exactly what this is for. It’s just a simple, no-fuss recipe, where everything on the ingredient list should already be in your pantry. This is really a clearing-the-fridge type of dinner, meant to get rid of all those unsavoury veggies sitting at the back of the pantry. It’s the kind of dinner you make when you’re exhausted after work. Anything can go in here: potatoes, mushrooms, parsley even. 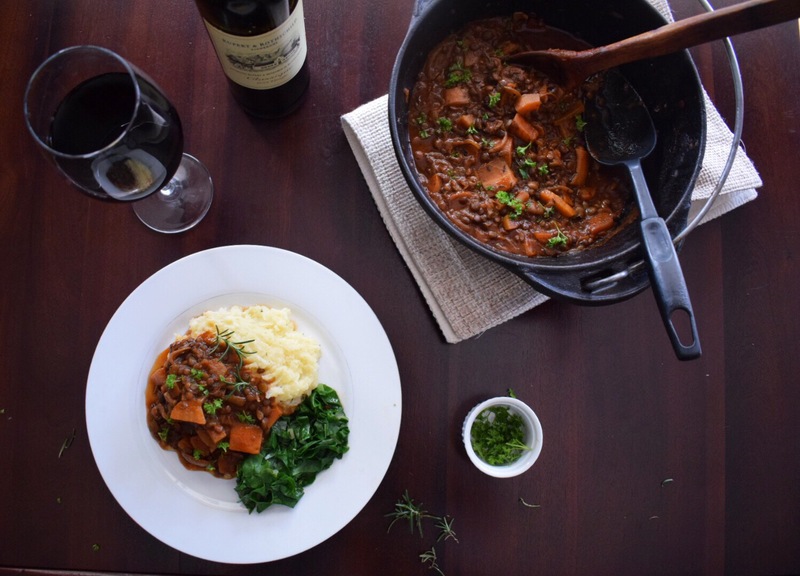 If you’re feeling a bit sneaky then you could even add a glass of red wine to the pot (I won’t tell) or a cup of Guinness beer to really jazz it up. Heat some oil in the bottom of a large cast iron pot. Fry the onions until soft and are just starting to caramelise, about 10 minutes. Add the garlic and carrots and cook for another 3 minutes, stirring frequently so the garlic doesn’t burn. Season with salt and pepper. Add the tomato paste and stir to coat the vegetables. Cook for 3 minutes, or until darkened considerably, stirring frequently to ensure it doesn’t burn. Pour in the vegetable stock and add the lentils and split green peas. Stir to combine everything, the tomato paste should have dissolved in the stock and the lentils and peas should be completely submerged. Add the oregano, thyme, basil, rosemary and cayenne pepper. Season again with salt and pepper. Bring to a boil before reducing the heat and allowing to simmer for 45 minutes, stirring occasionally. Add another cup of stock or water if the stew gets too thick and is at risk of burning. 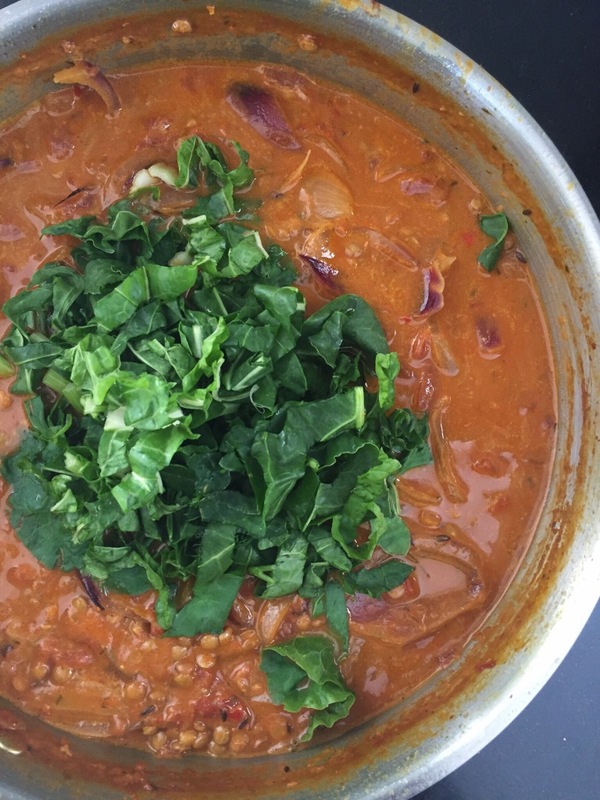 Once the pulses have cooked, taste for seasoning and adjust if needed. Give the pot a good stir before serving. This is best served on top of some steaming mashed potatoes or rice. Enjoy! Recently, I’ve been craving a dish with origins in the Maghreb area. Before giving up meat, lamb tagine was one of my favourite dishes to cook. 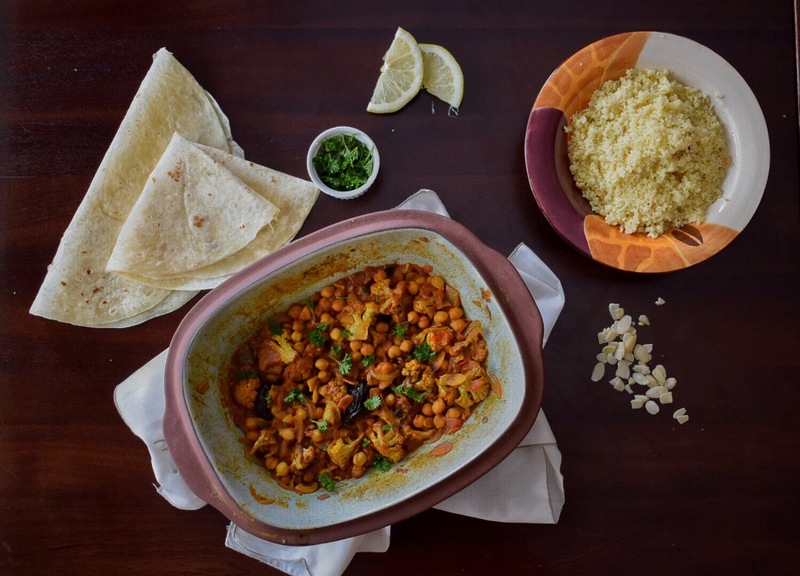 Having become vegetarian, I have been looking for ways to recreate the same spicy yet sweet flavours of Morocco that I had come to enjoy. A couple of years ago I bought my mother a cookbook on all things Morocco for her birthday. She had become obsessed with Marrakesh after one particular episode of The Amazing Race and she had added it to her list of places to travel to. Since then she’s visited the pyramids in Egypt, Interlaken in Switzerland and NgoroNgoro in Tanzania but Morocco hasn’t been fitted into her schedule as yet. Instead, we take a journey to Casablanca through our tastebuds and the magnificent cookbook that explains every aspect of Moroccan culture. As a veggie, I’ve found that there aren’t that many options for vegetarian tagine, I couldn’t find a single recipe in that book! 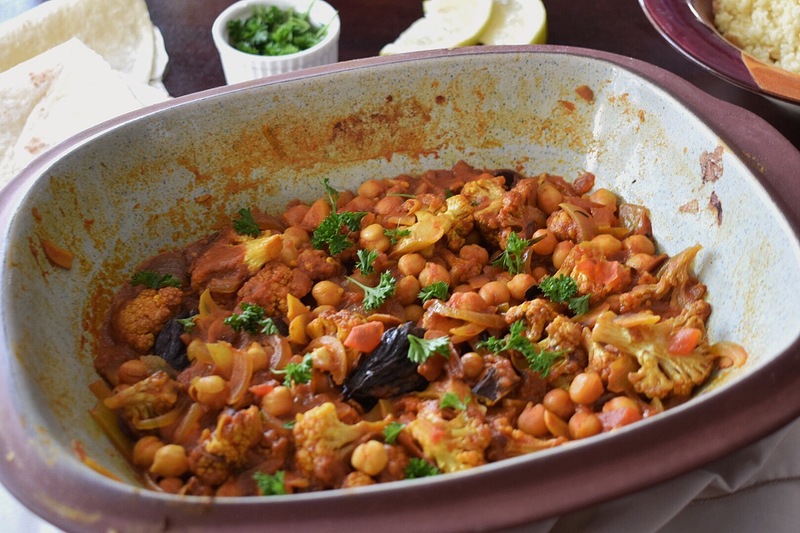 Refusing to give up, I modified the lamb tagine recipe, substituting lamb for chickpeas, and adding some of my own flair to this recipe via the roasted cauliflower. 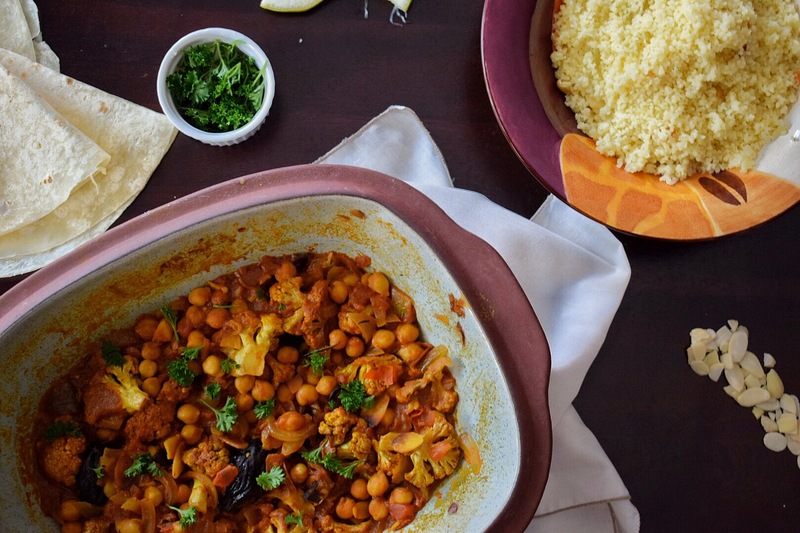 All the other ingredients are typical of a tagine and I beg you to not be thrown by the seemingly long ingredient list- you can do it! This is not a particularly fussy dish, you don’t need to spend 3 hours in the kitchen preparing it. 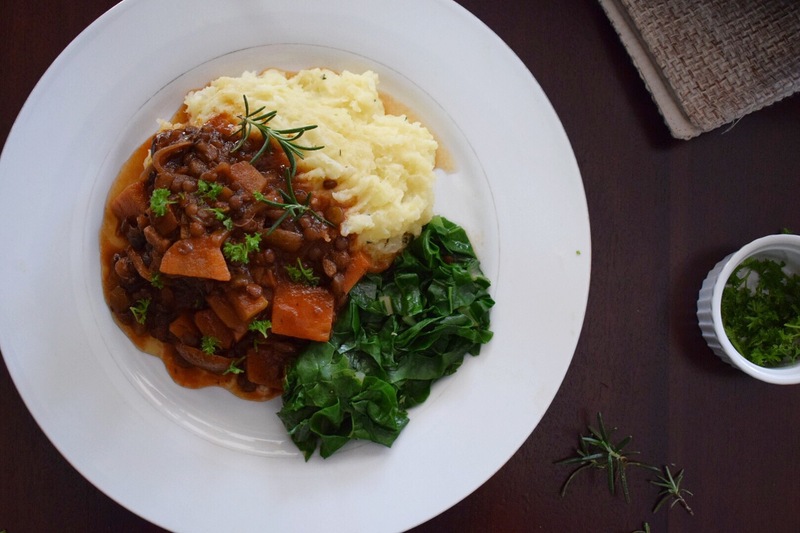 This is easy enough to be a weekly staple in your household yet sophisticated enough to wow your dinner party guests. I don’t own a traditional tagine, the closest thing we have in my house is this clay pot that my mother received as a gift for her 23rd birthday (centuries ago) but it does the job with no fuss. The only thing it lacks is the conical top of a tagine otherwise it does a splendid job at keeping the juices locked in. 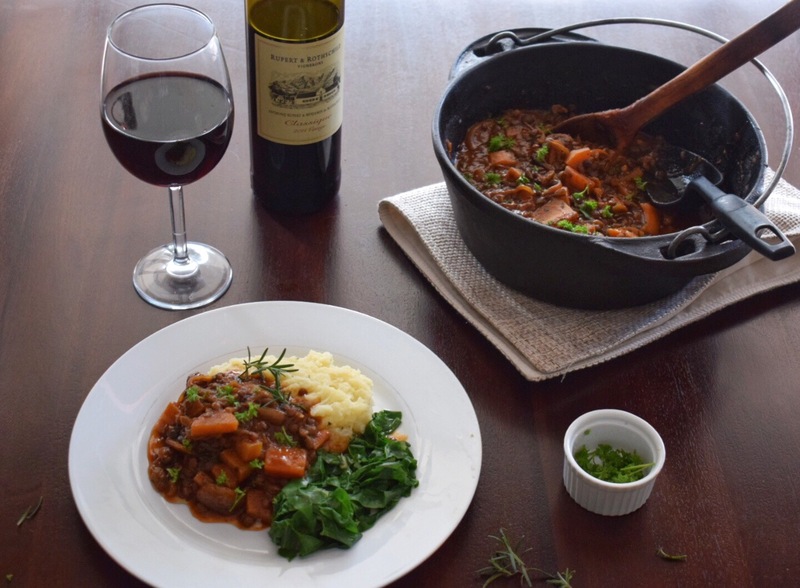 If you don’t own a tagine then there is no need to cry, you can use any heavy bottomed cast iron pot that you would otherwise use for stewing meat. 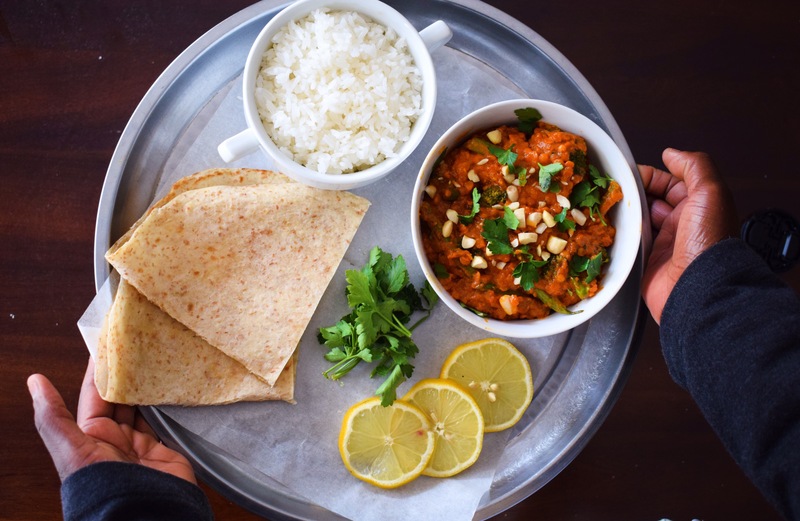 I hope that this dish opens you up to the flavours of Morocco and inspires you to try more North African dishes! On the blog, I already posted this easy Shakshuka recipe that has origins in North Africa but is eaten as far as Israel! Whoa! Once you’re satisfied with this bad boy, you should totally give it a try for breakfast the next morning. In a tagine or a large heavy bottomed pot, melt the butter/heat the olive oil and toast the almonds on low heat for 3 minutes or until deeply browned. Increase the heat and saute the onions until soft, 2 minutes. Throw in the garlic, ginger, rosemary, chillies, turmeric, cumin and cinnamon sticks. Cook until the spices are fragrant and the onions have cooked down, about 5 minutes. Pour in the vegetable stock and the tinned tomatoes, stir well and bring to a boil. Once at a rolling boil, add the chickpeas and stir to coat in the stew. Cover the pot/tagine with the lid and simmer for 25 minutes. 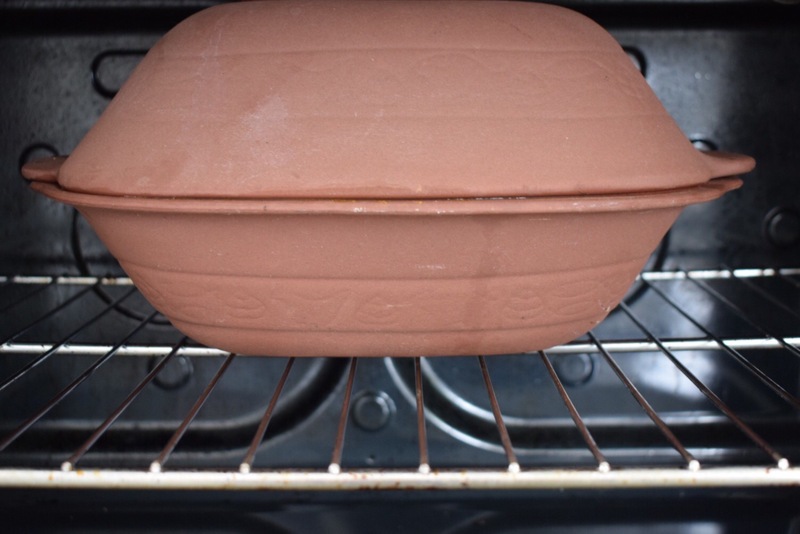 My clay pot was an awkward size and wasn’t heated evenly by the stove so I cooked mine in the oven at 180°C for 30 minutes. Either works perfectly fine so you can go with whatever works best for you. Meanwhile, work on the roasted cauliflower (instructions below). After 30 minutes, stir the stew and season with salt and pepper. Add the prunes and roasted cauliflower to the pot and simmer for a further 15 minutes. During this time, you can prepare the couscous (instructions below). Just before serving, stir in the honey to sweeten the dish and season with salt and pepper a final time. Serve hot, garnish with extra almonds and fresh parsley and serve with rotis and the buttery couscous. 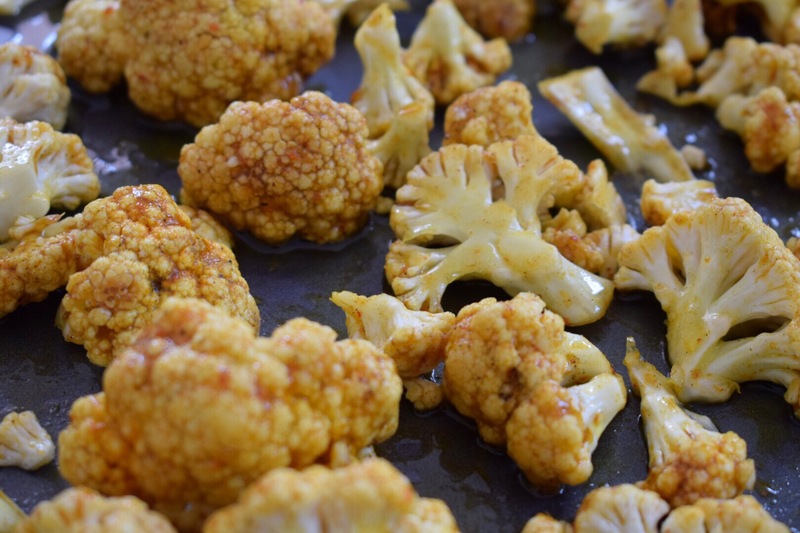 In a large bowl, toss together all the ingredients for the roasted cauliflower and lay in a single layer on a baking tray. Roast for 20 minutes before removing from the oven to cool. I saved a couple of roasted cauliflower florets to garnish and make the dish look prety when serving. Add the dry couscous to an ovenproof bowl (I used a Pyrex dish). Dissolve the salt in the boiling water and pour over the couscous. Set aside for 10 minutes in order for the couscous to absorb the liquid. Once absorbed, pour the olive oil over the couscous and use your hands to rub it into the couscous and break up any large clumps that may have formed. 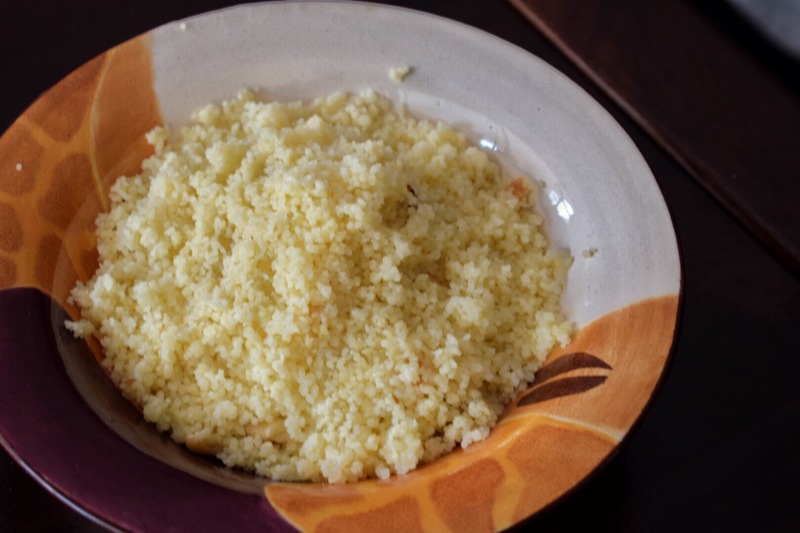 Dollop pieces of the butter over the surface of the couscous before covering the dish with aluminium foil, and leaving in an oven preheated to 180°C for 15 minutes to warm through. Remove from the oven and serve hot! Adjusting to a new diet has proven to be quite the challenge, but one of the most enlightening things is being introduced to a whole new section of the grocery store. 2 months ago, I probably would have scoffed at you if you brought chickpeas, lentils or butter beans anywhere near me. Now I embrace these staples as part of my daily regime. The shocked looks I get when I tell people about my meat-less habits haven’t ceased to amuse me. I’m sure that most people have visions of me sitting on the kitchen floor, crying whilst clutching my bowl of lettuce and carrots. Little do they know that I curl up on the love seat with a hot bowl of curry in my lap, warm naan to my left and cold yogurt to my right. The grass is indeed greener on this side. 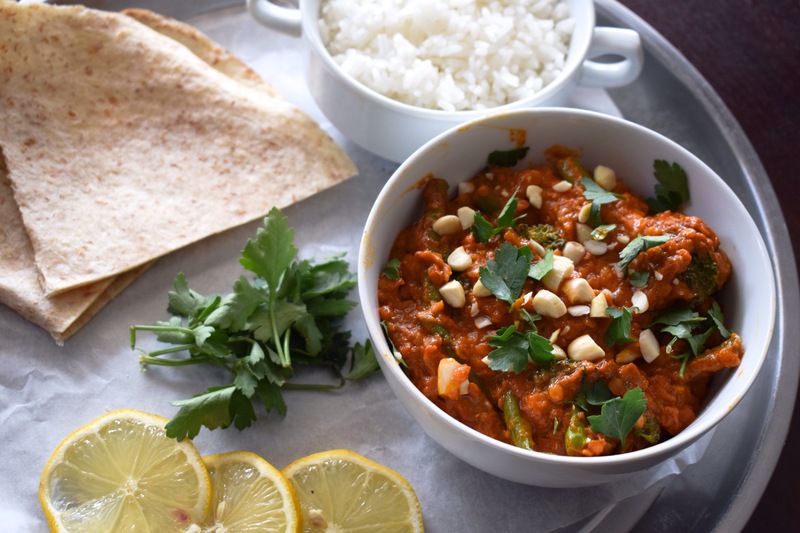 This dish starts with a homemade red curry paste that takes 5 minutes to prepare and can be stored in the fridge for all your future curry needs. YES. 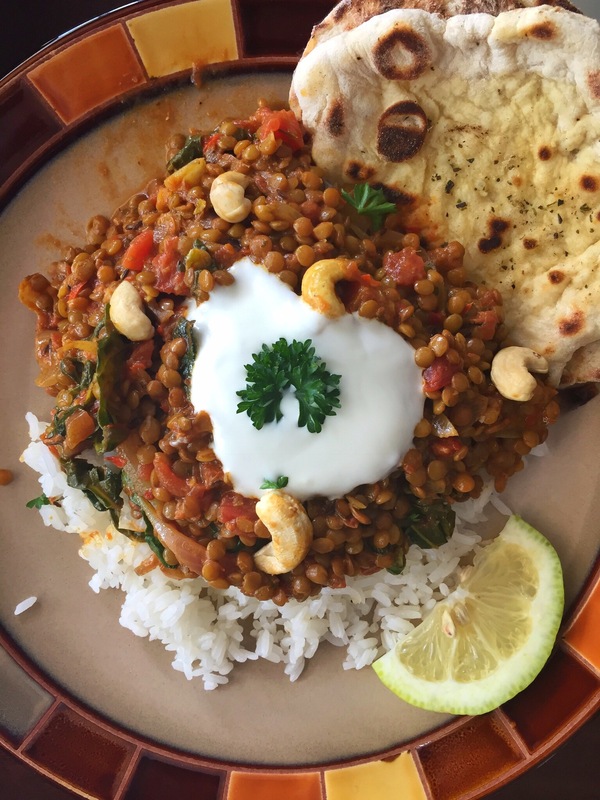 What I love about lentils is their insane nutritional points and incredible versatility. These are easily slipped into any curry, wrap or salad. I look forward to exploring all the fun ways to exploit this sneaky little bean but for now, I’ll start with this curry. 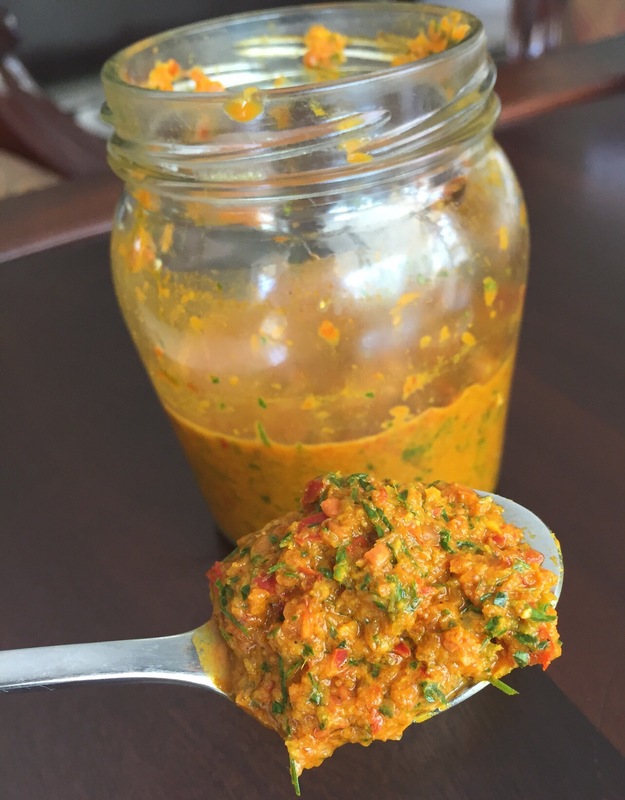 In a blender, combine all the ingredients for the red curry paste and pulse until combined. Add a tablespoon or two of water if it’s not blending well. Keep sealed in a glass jar and refrigerate until use. Will keep for up to 2 months in the fridge but you can freeze individual portions in ice trays if you would rather keep them frozen. Heat a tablespoon of olive oil in a deep saucepan and toast the cumin seeds for a minute before adding both the yellow and red onion. Fry the onions until translucent then add the red curry paste. Coat the onion in the paste and cook for another 2 minutes before adding the tinned tomatoes and coconut milk. Season with salt and pepper. Bring to a boil before adding the dried lentils and 2 cups of water. Reduce the heat to low and simmer for 30 minutes. 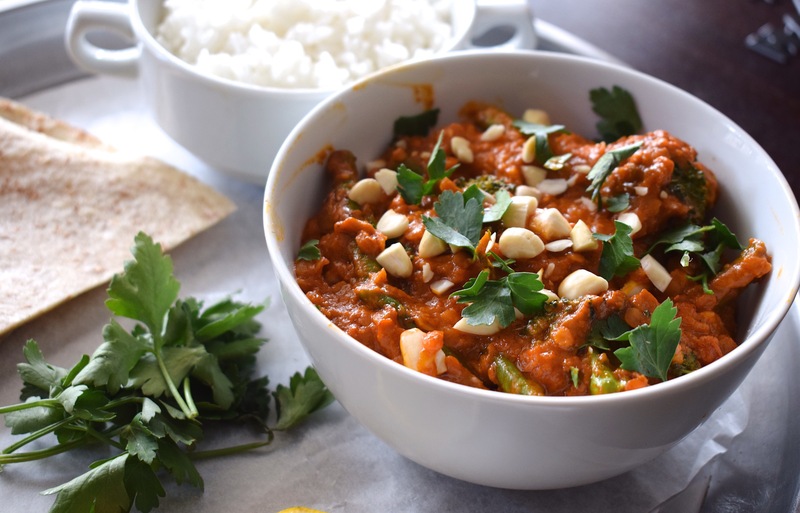 If after 30 minutes the curry is still very watery or is not at your desired consistency, increase heat to high and boil for 5-10 minutes or until it’s thick enough. 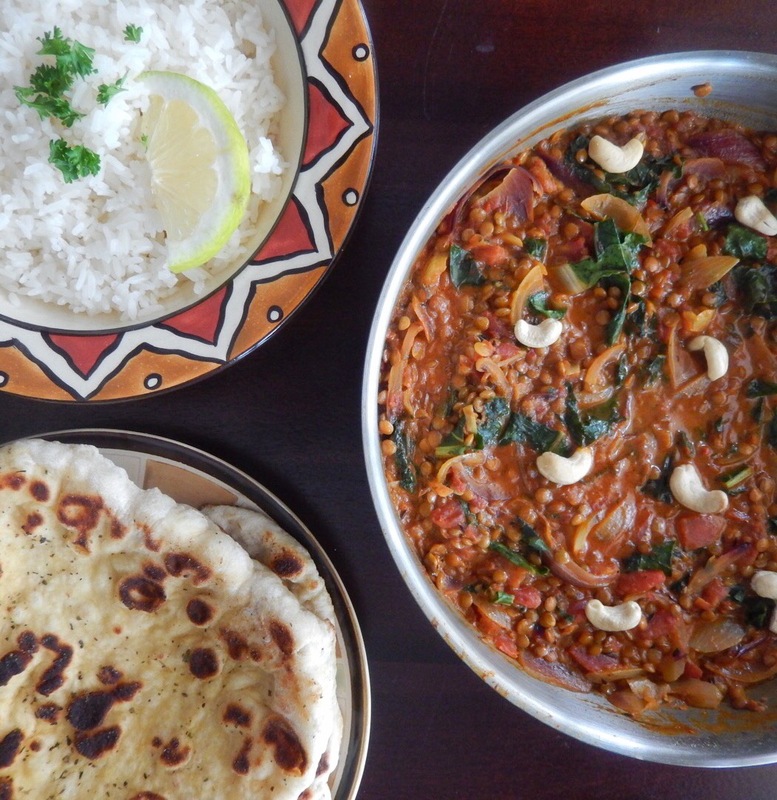 Before serving, add the spinach to the curry and cook on low for 5 minutes, or until wilted. 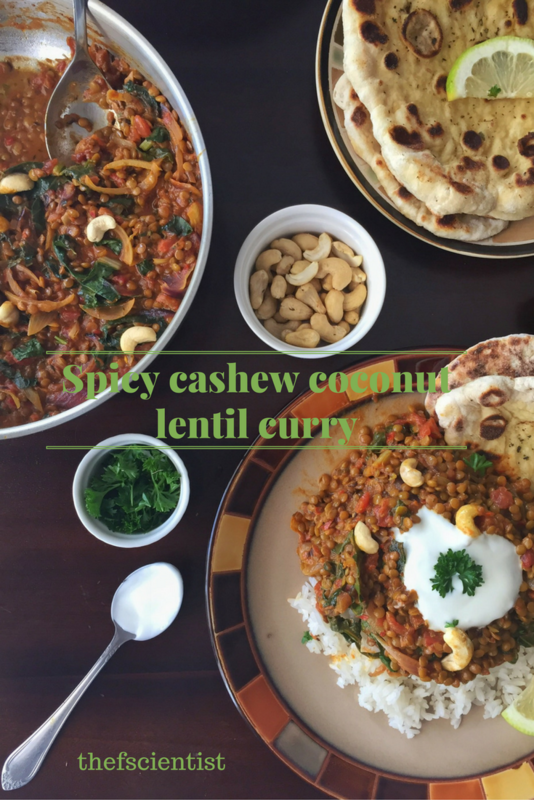 Serve hot with rice, naan and cashews, dollop natural yogurt on top if the curry is too spicy for you.